Abrams chose to shoot the film in the anamorphic format on 35mm film after discussions about whether the film should be shot in high-definition digital video. Cinematographer Dan Mindel and Abrams agreed the choice gave the film a big-screen feel and the realistic, organic look they wanted for the film setting. Abrams and Mindel used lens flares throughout filming to create an optimistic atmosphere and a feeling that activity was taking place off-camera, making the Star Trek universe feel more real. "There's something about those flares, especially in a movie that potentially could be incredibly sterile and CG and overly controlled. There's just something incredibly unpredictable and gorgeous about them." Mindel would create more flares by shining a flashlight or pointing a mirror at the camera lens, or using two cameras simultaneously and therefore two lighting set-ups. Editor Mary Jo Markey later said in an interview that he had not told her (or fellow editor Maryann Brandon) this, and initially contacted the film developers asking why the film seemed overexposed. ^ "STAR TREK". British Board of Film Classification. April 9, 2009. Retrieved May 22, 2013. ^ a b c "Star Trek (2009)". Box Office Mojo. Retrieved December 12, 2010. ^ Larry Carroll "'Star Trek' Sequel Will Deal With 'Unpredictable Future'". MTV. Retrieved March 13, 2011. ^ Larry Carroll (May 15, 2009). "'Star Trek' Director Open To Sequel With William Shatner Or Khan". MTV. Retrieved May 16, 2009. ^ Cargill, JD (May 8, 2009). "The Scene: 'Trek' actors dive onto Vulcan". CNN. Retrieved December 10, 2009. ^ Plait, Phil (May 8, 2009). "BA Review: Star Trek". Discover. Kalmbach Publishing. Retrieved December 10, 2009. ^ a b c d e Jeff Jensen (October 24, 2008). "'Star Trek': New Movie, New Vision". Entertainment Weekly. Retrieved October 16, 2008. ^ a b c d e John Jurgensen (January 2, 2009). "Boldly Revisiting Roles". The Wall Street Journal. Retrieved January 16, 2009. ^ "Wondercon 09: Star Trek Panel Detailed Report & Pictures". TrekMovie. February 28, 2009. Retrieved March 1, 2009. ^ Sally Browne (April 19, 2009). 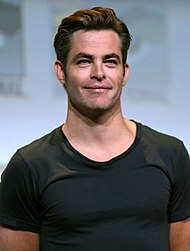 "Chris Pine fills big shoes in Star Trek's latest enterprise". The Courier-Mail. Retrieved April 18, 2009. ^ Anthony Pascale (April 14, 2008). "Grand Slam XVI: Two Spocks Rock The House". Trek Movie. Retrieved April 15, 2008. ^ Anthony Pascale (May 5, 2009). "Interview with Zachary Quinto". TrekMovie. Retrieved May 7, 2009. ^ Josh Horowitz (September 26, 2007). "Adrien Brody Confirms He Was Almost Mr. Spock". MTV. Retrieved October 6, 2007. ^ Nimoy, Leonard (May 10, 2012). "Leonard Nimoy Talks Tees, Trek And More, Part 2" (Interview). Interviewed by StarTrek.com staff. Retrieved May 18, 2012. ^ a b Pascale, Anthony (February 28, 2009). "WonderCon 09: Star Trek Panel Detailed Report & Pictures". TrekMovie.com. Retrieved March 1, 2009. ^ a b Geoff Boucher (March 29, 2009). "'Star Trek' writing pair cling on to their partnership". Los Angeles Times. Tribune Company. Retrieved March 29, 2009. ^ Vic Holtreman (April 13, 2008). "Hungry For More Star Trek Details? Here You Go!". Screen Rant. Archived from the original on August 2, 2008. Retrieved April 14, 2008. ^ Boucher, Geoff (May 11, 2009). "Leonard Nimoy: 'Star Trek' fans can be scary". Los Angeles Times. Retrieved March 1, 2015. ^ "Exclusive: A Conversation with Trek's Two Spocks". TV Guide. April 15, 2008. Archived from the original on October 21, 2008. Retrieved April 15, 2008. ^ "Abrams and Orci On Fan Reaction + Bob Meets Brannon". TrekMovie.com. January 16, 2009. Retrieved January 16, 2009. ^ Eric Goldman (January 9, 2008). "Karl Urban: From Comanche Moon to Star Trek". IGN. Retrieved January 23, 2008. ^ "Karl Urban on Star Trek and beyond". The New Zealand Herald. April 9, 2009. Retrieved April 11, 2009. ^ Anthony Pascale (September 28, 2007). "Karl Urban Up For 'Star Trek' Role (But Not Villain) + Casting & Plot Updates". TrekMovie. Retrieved December 28, 2008. ^ Wilson Morales (January 29, 2008). "Zoe Saldaña sheds a little light on playing 'Uhura'". Blackfilm. Retrieved January 30, 2008. ^ Larry Carroll (April 21, 2009). "New 'Star Trek' Cast Took Cues From The Classic Series". MTV. Retrieved April 23, 2009. ^ Jen Yamato (August 1, 2007). "Sydney Tamiia Poitier on Critics, Grindhouse, and the Final Frontier". Rotten Tomatoes. Retrieved December 28, 2008. ^ a b Siobhan Synnot (April 26, 2009). "Simon Pegg interview". Scotland on Sunday. Retrieved April 26, 2009. ^ Craig McLean (April 26, 2009). "Simon Pegg can still boldly go ... to East Kilbride". The Sunday Times. Retrieved April 26, 2009. ^ Erin Biba (July 21, 2008). "Simon Pegg's Geek Roots Show in Spaced". Wired. Retrieved October 2, 2008. ^ Steve Fritz (January 21, 2009). "From 'Trek' to 'Wars', Part 2: George Takei on Star Trek". Newsarama. Retrieved January 22, 2009. ^ "John John Cho: Sulu Is A Badass". TrekMovie. December 16, 2007. Retrieved February 16, 2008. ^ Anthony Pascale (March 17, 2008). "Cho Injured On Trek Set". TrekMovie. Retrieved March 19, 2008. ^ Ileane Rudolph (October 29, 2007). "Heroes Preview: Ando's Secret Superpower Desire". TV Guide. Retrieved October 31, 2007. ^ "JJ Abrams on the new Star Trek trailer". Empire Online. Retrieved November 17, 2008. ^ Cindy White (January 28, 2008). "Young Chekov Talks Trek". IGN. Retrieved January 28, 2008. ^ Shawn Adler (February 11, 2008). "Eric Bana Boldly Goes On About New 'Star Trek'". MTV. Retrieved February 12, 2008. ^ Brian Jacks (May 5, 2009). "Eric Bana Has Never Seen A 'Star Trek' Movie". MTV Movies Blog. Retrieved May 6, 2009. ^ "Bana calls 'Star Trek' role irresistible". United Press International. February 29, 2008. Retrieved October 13, 2008. ^ Anthony Pascale (February 26, 2008). "Bana Spoofs Star Trek Plot Details". TrekMovie. Retrieved October 13, 2008. ^ Peter Mitchell (March 6, 2009). "Bana dons face tattoos for new role". ninemsn. Retrieved March 9, 2009. ^ Anthony Pascale (May 9, 2007). "Greg Ellis Joins Star Trek Cast". TrekMovie. Retrieved February 19, 2009. ^ Trotter, Charles (January 29, 2008). "Meet The Young Kirk Boys". TrekMovie. Retrieved January 28, 2008. ^ William Keck (March 2, 2008). "Boldly go where they went before". USA Today. Retrieved March 10, 2008. ^ a b c d Patrick Lee (April 29, 2009). "Don't blink! We unearth a few Star Trek easter eggs". Sci Fi Wire. Retrieved April 29, 2009. ^ "Brad William Henke talks about his role in STAR TREK". Collider. September 13, 2008. Retrieved September 14, 2008. ^ Anthony Pascale (August 10, 2008). "Kirk Family Spoilers For New Star Trek". TrekMovie. Retrieved December 28, 2008. ^ "Interview With Greg Grunberg on TalkAboutIt.org, Heroes & Star Trek". TrekMovie. April 27, 2009. Retrieved April 27, 2009. ^ Jordan Hoffman (April 28, 2009). "Roberto Orci – Star Trek Interview". UGO Networks. Retrieved April 28, 2009. ^ "How J.J. Abrams snuck Wesley Crusher into Star Trek!". Sci-Fi Wire. November 4, 2009. Retrieved December 18, 2009. ^ Charles Trotter (May 2, 2009). "Fun Stuff In Official Star Trek Movie Credits". TrekMovie. Retrieved May 4, 2009. ^ Jablon, Robert (December 18, 2008). "Majel Roddenberry, widow of 'Trek' creator, dies". San Jose Mercury-News. Associated Press. Retrieved December 18, 2008. ^ a b Christina Radish (April 26, 2009). "Interview: J.J. Abrams on Star Trek". IESB. Retrieved April 27, 2009. ^ Meredith Woerner (May 11, 2009). "The Shatner Scene You Never Saw In Abrams' Star Trek". io9. Retrieved May 12, 2009. ^ Clayton Neuman (September 8, 2008). "Masters of SciFi – J.J. Abrams on Reviving Frankenstein in Fringe and Adhering to Canon With Star Trek". AMC. Retrieved September 9, 2008. ^ William Keck (January 21, 2008). "Celeb Watch: Shatner's gone there before, but new 'Trek' isn't on frontier". USA Today. Retrieved March 26, 2008. ^ Vic Holtreman (April 13, 2008). "Hungry For More Star Trek Details? Here You Go!". Screen Rant. Retrieved April 14, 2008. ^ Greg Parker (June 29, 2008). "Nichelle Nichols Almost Had 'Star Trek' Cameo?". TrekMovie. Retrieved June 30, 2008. ^ Robert Sanchez (November 10, 2007). "Keri Russell Talks Star Trek". IESB. Retrieved December 28, 2008. ^ Hughes, David (July 15, 2008). The Greatest Sci-Fi Movies Never Made (Revised ed.). Titan Books. pp. 35, 37, 44–46. ISBN 978-1-84576-755-6. ^ a b Dave Itzkoff (April 23, 2009). "New team retrofits old ship". The New York Times. The New York Times Company. Retrieved April 26, 2009. ^ a b c d Anthony Pascale (January 25, 2008). "Star Trek Cast & Crew Fan Chat Transcript + Pictures From The Set". TrekMovie.com. Retrieved January 27, 2008. ^ a b c d e Anthony Pascale (October 4, 2007). "Interview – Roberto Orci On Why He Is A Trekkie & Making Trek Big Again". TrekMovie.com. Retrieved September 20, 2008. ^ Steve Krutzler (June 7, 2006). "Abrams Cohorts Emphasize Respect for Mythology in Trek XI, Say Script Will Contain Old and New". TrekWeb.com. Archived from the original on July 9, 2006. Retrieved August 20, 2006. ^ a b c d e f g Jeff Jensen (October 24, 2008). "'Star Trek': New Movie, New Vision". Entertainment Weekly. Time, Inc. Retrieved October 16, 2008. ^ Pascale, Anthony (December 5, 2007). "Paramount Updates Star Trek Credits & Official Synopsis + Adds Production Partner". TrekMovie.com. Retrieved December 9, 2007. ^ Pascale, Anthony (December 30, 2008). "Super High Resolution Images For 'Star Trek' 2009". TrekMovie.com. Retrieved December 31, 2008. ^ a b Geoff Boucher (January 29, 2009). "J.J. Abrams on tribbles and the 'Galaxy Quest' problem". Los Angeles Times. Tribune Company. Retrieved January 29, 2009. ^ Tatiana Siegel (February 24, 2007). "Abrams takes helm of 'Star Trek'". The Hollywood Reporter. Archived from the original on May 16, 2008. Retrieved April 14, 2008. ^ Goldman, Eric (May 16, 2008). "Abrams Talks Trek, Cloverfield 2". IGN. Retrieved May 16, 2008. ^ a b Hugh Hart (October 2, 2008). "Star Trek Writers Brace for Impact". Wired. Condé Nast Publications. Retrieved October 3, 2008. ^ a b c Anthony Pascale (December 11, 2008). "Bob Orci Explains How The New Star Trek Movie Fits With Trek Canon (and Real Science)" (Some information is taken from subsequent comments by Orci under the username "boborci"). TrekMovie.com. Retrieved December 23, 2008. ^ a b c Patrick Lee (March 26, 2009). "Orci & Kurtzman: Why they don't call Star Trek a reboot". Sci Fi Wire. Retrieved March 26, 2009. ^ a b c Anthony Pascale (April 30, 2009). "Star Trek Writers Alex Kurtzman & Roberto Orci". TrekMovie.com. Retrieved May 1, 2009. ^ Helen O'Hara (November 14, 2008). "Klingon Subplot Revealed". Empire. Retrieved November 14, 2008. ^ "Star Trek: Behind the scenes" (Video). The Hollywood Reporter. Lynne Segall. Retrieved April 3, 2009. ^ Patrick Lee (March 24, 2009). "Orci & Kurtzman: What familiar Star Trek bits will you see in the new movie?". Sci Fi Wire. Retrieved March 24, 2009. ^ a b c Goldsmith, Jeff (May 16, 2009). "Star Trek Q&A". Creative Screenwriting. Retrieved May 16, 2009. ^ Jeff Jensen (October 17, 2008). "Inspirations for a whole new Enterprise". Entertainment Weekly. Retrieved December 15, 2008. ^ a b c d Anthony Pascale (December 10, 2008). "Exclusive Interview: Roberto Orci On All The Latest With Star Trek (and more)". TrekMovie.com. Retrieved December 9, 2008. ^ a b Anthony Pascale (January 19, 2008). "Interview – Orci Answers Questions About New Star Trek Trailer". TrekMovie.com. Retrieved January 21, 2008. ^ Josh Horowitz (March 8, 2007). "'Star Trek' Writers Talk Direction, Technobabble – But Not Matt Damon". MTV. Retrieved August 7, 2007. ^ a b Anthony Pascale (October 8, 2007). "Interview – Orci Talks Casting, Characters, Canon and Kirks". TrekMovie.com. Retrieved September 25, 2008. ^ a b Anthony Pascale (April 13, 2008). "Grand Slam XVI: Highlights From Orci Q&A". TrekMovie.com. Retrieved April 13, 2008. ^ Bryan Cairns (March 23, 2009). "To Boldly Go ... 'Star Trek' Executive Producer Bryan Burk". Newsarama. Retrieved March 23, 2009. ^ "Star Trek Magazine No. 17 Preview + Scott Chambliss Interview Extract". TrekMovie.com. March 20, 2009. Retrieved March 20, 2009. ^ Vic Holtreman (March 24, 2009). "Exclusive Interview With The Man Behind Star Trek's Props". Screen Rant. Archived from the original on March 27, 2009. Retrieved March 24, 2009. ^ Eric Vespe (March 18, 2008). "Why do these shots from the filming of "Corporate Headquarters" look suspiciously like the Starfleet Academy?". Ain't It Cool News. Retrieved September 25, 2008. ^ a b c d e f g "Production notes". StarTrekMovie.com. Retrieved May 4, 2009. Enter the main site and click "About" on the navigation menu to access. ^ Pascale, Anthony (May 3, 2009). "TrekMovie Hollywood Premiere Video Interviews w/ Trek Celebs (Past & Present)". TrekMovie.com. Retrieved May 4, 2009. ^ Helen O'Hara (October 28, 2008). "Empire Star Trek Cover". Empire. Bauer Media Group. Retrieved October 28, 2008. ^ Sampson, Mike (October 15, 2008). "EXCL: Star Trek pic!". JoBlo.com. Retrieved October 15, 2008. ^ a b Joe Nazzaro (April 6, 2009). "FX artists create new aesthetic for 'Star Trek' franchise". Makeup Mag. Archived from the original on April 12, 2009. Retrieved April 6, 2009. ^ Bill Desowitz (May 15, 2009). "Creature Designer Neville Page Talks Star Trek". Animation World Network. Retrieved May 17, 2009. ^ Patrick Lee (March 20, 2009). "Star Trek "doctor" reveals details of Kirk's birth in Abrams' film". Sci Fi Wire. Retrieved March 20, 2009. ^ Anthony Pascale (March 27, 2008). "Star Trek Wraps". TrekMovie.com. Retrieved March 28, 2008. ^ Anthony Pascale (April 9, 2008). "Producer Talks 'Iowa' Shoot + VIDEO Of Scene Being Shot". TrekMovie.com. Retrieved April 10, 2008. ^ Paul Eakins (December 19, 2007). "Council Returns after 'Trek'". Long Beach Press-Telegram. ^ "Motion Picture Incentive Fund". Economic Development Corporation of Utah. February 4, 2009. Retrieved February 4, 2009. ^ Anthony Pascale (March 18, 2008). "CSUN Transformed Into Academy". TrekMovie.com. Retrieved March 19, 2008. ^ Cynthia Littleton, Michael Schneider (November 5, 2007). "WGA strike hit the streets". Variety. Retrieved November 6, 2007. ^ Benjamin Svetkey (November 8, 2007). "Writers' strike: Imagining the worst-case scenario". Entertainment Weekly. Time, Inc. Retrieved November 12, 2007. ^ a b Anthony Pascale (March 1, 2008). "Exclusive Interview: Damon Lindelof On New Release Date and Trek Appealing To Wider Audience". TrekMovie.com. Retrieved March 3, 2008. ^ Alex Billington (January 14, 2009). "Kicking Off 2009 with Writers Alex Kurtzman and Roberto Orci – Part Two: Transformers 2". First Showing. Retrieved January 14, 2009. ^ Anthony Pascale (May 5, 2009). "Interview with Zachary Quinto". TrekMovie.com. Retrieved May 7, 2009. ^ Rogers, Troy (December 20, 2007). "Karl Urban Talks Comanche Moon Mini-series and Star Trek". The Dead Bolt. Retrieved January 11, 2012. ^ "Morrison and Nichols Talk a little Trek". TrekMovie.com. April 23, 2008. Retrieved April 25, 2008. ^ "Simon Spills On Star Trek". Sky Living. December 6, 2007. Retrieved January 11, 2012. ^ Anthony Pascale (November 6, 2007). "'Star Trek' Extras Open Casting Call – Looking for Unique Faces". TrekMovie.com. Retrieved January 20, 2008. ^ Dan Madsen (March 24, 2009). "Mania Exclusive Interview: Eugene Roddenberry, Jr". Mania. Archived from the original on March 25, 2009. Retrieved March 24, 2009. ^ Anthony Pascale (June 24, 2008). "Ron Moore Talks Movies (Past and Future)". TrekMovie.com. Retrieved November 23, 2008. ^ a b Goldman, Michael (April 20, 2009). "Back on Trek; How J.J. Abrams led the Star Trek revival". Millimetre. p. 2. Retrieved April 28, 2009. ^ Tapley, Christopher. "Tech Support Interview: The crafts of 'Star Trek'". In Contention. Retrieved December 24, 2015. ^ a b c Bill Desowitz (May 12, 2009). "Where No Star Trek Has Gone Before". Animation World Network. Retrieved May 15, 2009. ^ a b c d McGorry, Ken (May 1, 2009). "Star Trek Returns". Post Magazine. Archived from the original on May 8, 2009. Retrieved May 4, 2009. ^ Jeff Jensen (November 11, 2008). "'Star Trek': An exclusive first look at the Enterprise". Entertainment Weekly. Retrieved March 8, 2009. ^ "How ILM came up with the new Enterprise for J.J. Abrams' Trek". Sci Fi Wire. April 17, 2009. Retrieved April 17, 2009. ^ Pascale, Anthony (February 11, 2008). "Interview with Star Trek's new science advisor". TrekMovie.com. Retrieved December 21, 2011. ^ "JJ Abrams on the new Star Trek trailer". Empire. Bauer Media Group. Retrieved November 17, 2008. ^ a b Dan Goldwasser (April 21, 2009). "Michael Giacchino hits warp speed with his score to Star Trek". ScoringSessions.com. Retrieved April 21, 2009. ^ Cindy White (November 1, 2007). "Trek Score Will Keep Theme". Sci Fi Wire. Archived from the original on February 2, 2008. Retrieved November 3, 2007. ^ Anthony Pascale (March 23, 2008). "Giacchino's Star Trek Soundtrack Announced – Available For Pre-order". TrekMovie.com. Retrieved March 25, 2008. ^ "Two Steps From Hell: Music for Motion Picture Advertising". TwoStepsFromHell.com. Archived from the original on October 23, 2010. Retrieved March 13, 2011. ^ Michael Kunkes (April 29, 2009). "More Sound Trekking". Motion Picture Editors Guild. Retrieved May 7, 2009. 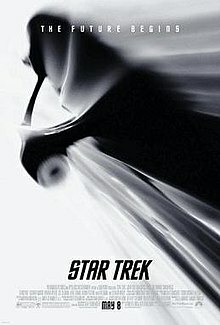 ^ "'Star Trek' boldly goes to summer 2009 in schedule shift". KATU. February 15, 2008. Archived from the original on March 31, 2012. Retrieved January 12, 2012. ^ Anthony Pascale (February 12, 2009). "Alan Dean Foster Writing Star Trek Movie Adaptation". StarTrek.com. Retrieved February 12, 2009. ^ Anthony Pascale (March 19, 2009). "ST09 Tidbits (Spocks Edition): Nimoy Supports Vulcans [UPDATED] + Quinto Reads Audiobook & Appears in GQ". StarTrek.com. Retrieved April 4, 2009. ^ "Austin, TX Fans Given Surprise Showing of ENTIRE Star Trek Movie". StarTrek.com. April 6, 2009. Retrieved April 7, 2009. ^ "Star Trek to get Sydney premiere". BBC News. March 20, 2009. Retrieved March 19, 2009. ^ Anthony Pascale (March 20, 2009). "ST09 Tidbits (T-48 days): Vulcan Gets A 'Yes' + New Esurance Contest + New Kellogg's Promos + more". StarTrek.com. Retrieved March 20, 2009. ^ Charles Trotter (January 21, 2008). "Trek Welder Talks Teaser Shoot". StarTrek.com. Retrieved October 2, 2008. ^ Lauer, Andy (June 5, 2009). ""Man on Wire," "The Wrestler" Among 2009 Golden Trailer Winners". indieWIRE. Retrieved January 12, 2012. ^ Jay A. Fernandez and Borys Kit (November 21, 2008). ""Star Trek" promo blasting off six months early". Reuters. Retrieved November 22, 2008. ^ Stanley, T.L. (April 16, 2009). "Paramount forges 'Star Trek' tie-ins". The Hollywood Reporter. Prometheus Global Media. Retrieved April 17, 2009. ^ a b "CBS Announces New Star Trek Licenses – Including Monopoly, Uno, Apparel, Fragrances + more [UPDATED]". StarTrek.com. January 28, 2009. Retrieved January 28, 2009. ^ John Tenuto (January 27, 2008). "Star Trek Headed Back To Playmates". TrekMovie.com. Retrieved January 28, 2008. ^ John Tenuto (November 19, 2008). "Details On First Two Waves Of Playmates Star Trek Movie Toys + Nero's Ship Name Revealed [UPDATED]". StarTrek.com. Retrieved November 24, 2008. ^ John Tenuto (January 23, 2009). "Exclusive Details On Playmates Full Line Of Star Trek Movie Toys + Hi Res Images". StarTrek.com. Retrieved January 24, 2009. ^ John Tenuto (January 26, 2008). "Corgi Announces Star Trek Movie License". TrekMovie.com. Retrieved January 28, 2008. ^ John Tenuto (January 19, 2009). "Star Trek Hot Wheels Coming in May". StarTrek.com. Retrieved January 19, 2009. ^ John Tenuto (February 12, 2009). "CBS Introduces Star Trek QUOGS – New Cartoon-style TOS Character Designs For Multiple Products". StarTrek.com. Retrieved February 12, 2009. ^ ""Star Trek" DVDs will beam up on Nov. 17th". The Times-Picayune. Ashton Phelps Jr. July 29, 2009. Retrieved July 23, 2009. ^ "Star Trek XI 2-disc edition". Amazon.com. Retrieved July 23, 2009. ^ "Star Trek (2009)" (in Swedish). WebHallen. Retrieved January 12, 2012. ^ Arnold, Thomas (November 25, 2009). "'Star Trek' tops video charts". The Hollywood Reporter. Prometheus Global Media. Retrieved January 12, 2012. ^ "Top Selling DVDs of 2009". The Numbers. Retrieved January 12, 2012. ^ Rosario T. Calabria (May 11, 2009). "Final Numbers In – Star Trek Breaks Franchise & IMAX Records + Outpeforming Batman Begins". TrekMovie.com. Retrieved May 12, 2009. ^ "Star Trek Movies". Box Office Mojo. Retrieved June 17, 2009. ^ "UIP International Box Office Gross". United International Pictures. October 1, 2009. Archived from the original on October 5, 2009. Retrieved October 25, 2009. ^ "2009 WORLDWIDE GROSSES". Box Office Mojo. Retrieved October 29, 2009. ^ Anthony Pascale (July 1, 2009). "ST09 Tidbits: Last Day in Top 10? + More Khan Debate + More Trek/Wars + more". TrekMovie.com. Retrieved August 2, 2009. ^ a b c d e Burr, Ty (May 5, 2009). "A Fresh Frontier". Boston Globe. The New York Times Company. Retrieved May 6, 2009. ^ a b Gleiberman, Owen (May 8, 2009). "Star Trek". Entertainment Weekly. Time, Inc. Retrieved December 21, 2011. ^ a b Traver, Peter (May 6, 2009). "Star Trek". Rolling Stone. Retrieved December 21, 2011. ^ Dargis, Manohla (May 8, 2009). "Star Trek (2009)". New York Times. The New York Times Company. Retrieved May 10, 2009. ^ Stevens, Dana (May 6, 2009). "Go See 'Star Trek'". Slate. The Washington Post Company. Retrieved May 10, 2009. ^ a b Huddleston, Tom (May 7, 2009). "Star Trek (2009)". Time Out London. Retrieved December 21, 2011. ^ Robey, Tim (May 7, 2009). "Star Trek review". The Daily Telegraph. UK: Telegraph Media Group. Retrieved December 21, 2011. ^ Bradshaw, Peter (December 21, 2011). "Star Trek". The Guardian. London: Guardian News and Media. Retrieved May 7, 2009. ^ Phipps, Keith (May 7, 2009). "Star Trek". The A.V. Club. The Onion. Retrieved December 21, 2011. ^ Ebert, Roger (May 6, 2009). "Star Trek". Chicago Sun-Times. Sun-Times Media Group. Retrieved May 10, 2009. ^ Bain, Marc (May 5, 2009). "Enterprise Ethics". Newsweek. Ray Chelstowski. Retrieved December 21, 2011. ^ Lapidos, Juliet (May 7, 2009). "There Are Four Lights!". Slate. The Washington Post Company. Retrieved December 21, 2011. ^ "Star Trek Wins Hollywood Movie Award". TrekMovie.com. October 27, 2009. Retrieved December 23, 2011. ^ "The 16th Annual Screen Actors Guild Awards". Screen Actors Guild. Retrieved December 23, 2011. ^ "Nominees And Winners". National Academy of Recording Arts and Sciences. Retrieved December 22, 2011. ^ "Nominees". National Academy of Recording Arts and Sciences. Retrieved December 22, 2011. ^ "38 Years. Hundreds of Memories". Retrieved January 12, 2012. ^ West, Kelly (June 15, 2009). "Nominations Posted For 2009 Teen Choice Awards". Cinema Blend. Retrieved December 23, 2011. ^ "THE 15th CRITICS' CHOICE MOVIE AWARDS NOMINEES". Broadcast Film Critics Association. Archived from the original on October 17, 2010. Retrieved December 23, 2011. ^ "Up In the Air named 2009's Best Film by the National Board Review". National Board of Review of Motion Pictures. December 3, 2009. Archived from the original on December 18, 2011. Retrieved December 23, 2011. ^ Pascale, Anthony (April 6, 2008). "Paramount Already Thinking About Sequel To Abrams Star Trek". TrekMovie.com. Retrieved June 5, 2008. ^ Schwartz, Terri (July 28, 2011). "J.J. Abrams Closes In On Directing "Star Trek 2"". MTV (Viacom). Retrieved December 23, 2011. ^ Brodesser-Akner, Claude (September 13, 2011). "J.J. Abrams Officially Commits to Directing Star Trek 2". New York. Archived from the original on September 18, 2011. Retrieved September 17, 2011. ^ Vary, Adam (September 10, 2012). "'Star Trek' sequel gets a title". Inside Movies. Entertainment Weekly. Retrieved September 13, 2012. ^ "Paramount Moves 'Star Trek' 3D Sequel Back 11 Months to 2013". TheWrap. Retrieved June 5, 2012.